A slimmer back cushion option, The Original McKenzie® SlimLine™ Lumbar Support measures only 2½" deep with the shape of a crescent moon. The SlimLine is ideal for elderly or petite people and those who cannot tolerate larger, more intrusive supports. Featuring a non-wrinkle, moisture-wicking, 100% polyester removable cover. 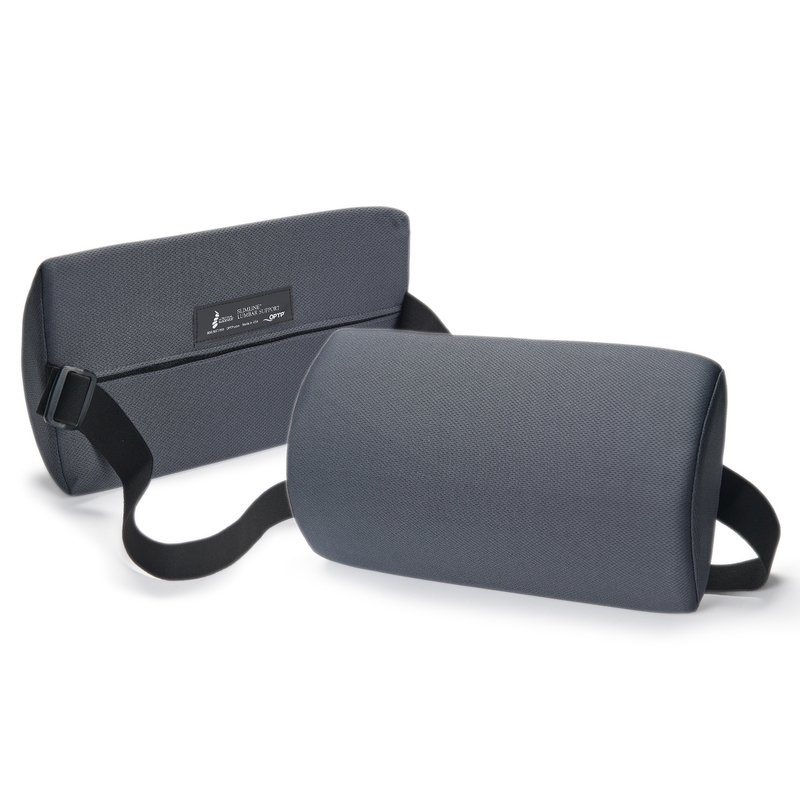 The SlimLine measures approximately 13½" L x 2½" D x 8" H. Features a built-in adjustable latex strap. Made in the USA. I have used one of these in two different cars which did not have good lumbar support in the drivers seat. It made a big improvement in being comfortable vs. feeling back discomfort after driving for about half an hour or more. Makes a big difference on long drives. Overall, a low cost improvement vs. more expensive model car seat. It is softer than the regular McKenzie lumbar roll, and for me, was a better choice for the car. The foam can become twisted inside the cover after a while, but it is easy just to unzip the cover and straighten the foam inside. It is washable. First attempt at lumbar support, purchased for my work chair, proved to be pure bliss. It&apos;s true you have to adjust it every time you sit, and sometimes in between, but it feels so good you can&apos;t complain. Foam is just right; not too soft or too firm, not too large or too small. I believed I found the perfect fit on my first try. Now that I&apos;ve learned of the thoracic support model, I want to try that. Watch for my review for that model. I always use this lumbar support when driving. Last summer I went to visit friends and family on a five day road trip from New Jersey to Massachusetts, Maine and Vermont. When I got to Massachusetts after driving ten hours, the daughter of my friends said that my back must hurt from all that driving. The next morning she went in the car with me and saw me place the SlimLine behind my back and said, "That must be why your back didn&apos;t hurt" She was right!